International Journal of Research in Health Sciences,2016,4,2,35-38. 1Professor & HOD, 2,5Post Graduate, 3,4,6Assistant Professor, Department of Biochemistry, Chettinad Hospital And Research Institute (CHRI), Tamilnadu, INDIA. Background: Cohort and large population studies proved the increased prevalence of metabolic syndrome in urban population but unfortunately not much survey has been done in rural side especially on women’s health. Silent gradual transformation of villages is happening and this metamorphosis slowly increasing the incidence of non communicable diseases among them. Hence we decided to do a pilot study on the prevalence of metabolic Syndrome among Women, the breadwinners of rural community. Aim: To find out the prevalence of metabolic syndrome in rural and urban women. Materials and Methods: 80 samples were collected from female participants of age group of 20-70 years.40 were from urban (madipakkam, Chennai) and 40 from rural (G.D.kandigai, Gummidipoondi) area. Women with chronic ailments were excluded. Details of the patient were obtained in the form of Questionnaire. After getting consent, anthropometry and demographic details are recorded. Fasting blood sample was collected using red top and grey top vacutainers and the following tests are processed on the same day. ( Fasting Plasma Glucose, Triglycerides, High density Lipoprotein). BP was recorded. Metabolic syndrome was diagnosed using modified NCEP-ATPIII criteria. Results: Statistical analysis performed using SPSS software version21.Prevalence was expressed as percentage (%).The overall Prevalence of metabolic syndrome including both the groups was 66.25%.It was 55% among rural and 77.5% among urban women. Individual parameters analysed in both the groups which showed increased waist circumference and decreased HDL. 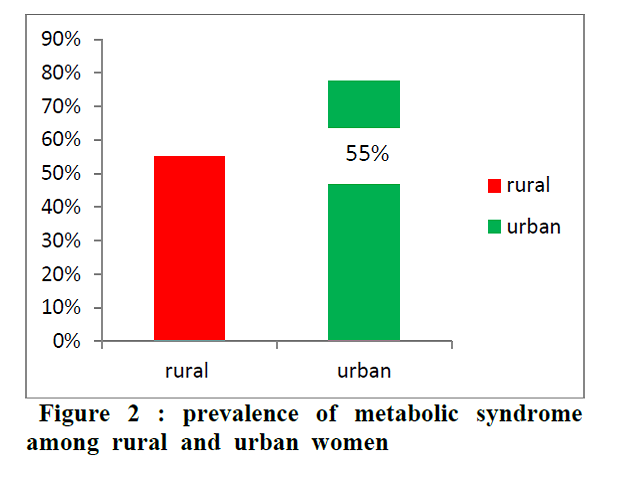 Conclusion: This pilot study shows that metabolic syndrome is prevalent in rural women too though less than urban women due to lifestyle modifications and altered food habits and stressful life. Government has to create policies to curb this epidemic among rural women.